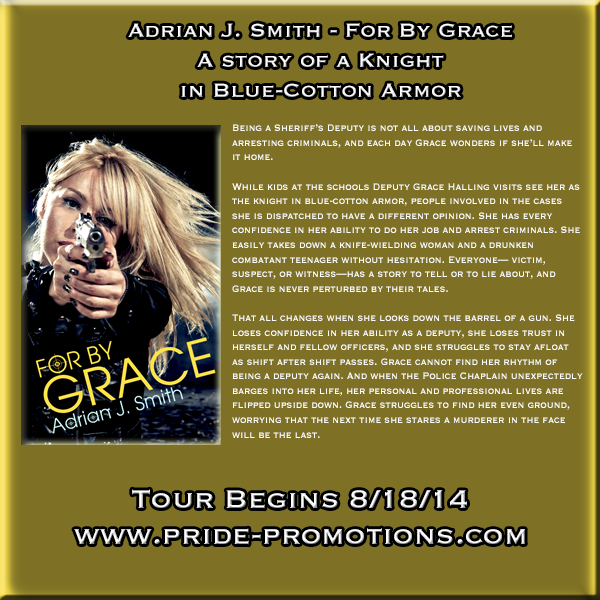 Adrian J. Smith is here today for her blog tour. 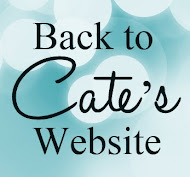 She's answering our questions, sharing and excerpt, and there's even a giveaway! What was the most challenging part of writing For by Grace? Keeping a balance of the depressing and the funny. Luckily there are a whole lot of things police encounter than can be both! I think I was able to find a steady balance between the two. What do you use your 86 pennies for? Haha! Wouldn’t you like to know!? It’s actually a reference. When someone gets 86’d, since I have a bad habit of killing people off in my novels. How do you handle reviews, good and bad? Good reviews I’ll repost after sharing with a few select friends. Bad reviews I will share with a few select friends, have a bit of a pity party, and then go on with my day. I’ve only truly gotten one terrible review, and I think the individual was more just pissed about the ending of the novel and was running on it when the review was posted. It was for For by Grace, actually. I took a few hours to have some chocolate and tell all my close writerly type friends and my fiancé and then I went back to life as normal. 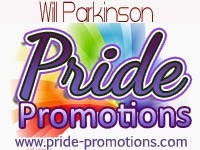 What is the best thing about writing LGBT fiction? The community so far. I write lesbian fiction which is even smaller than gay fiction, and there are only so many of us out there who write it. I find the community of writers to be the best because we’re always there to help support the others. 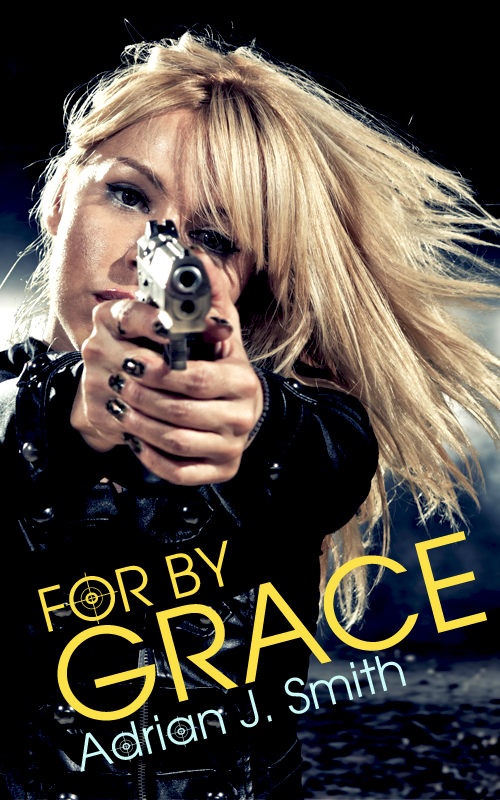 I’m actually working on the sequel to For by Grace, titled Fallen from Grace. It’s the second book in what should be a series of three. I’ll probably finish writing it before this blog post goes live, but I’ll still be in the editing dungeon! I’m also working on a new series titled Quarter Life. I have the first book about a third of the way written. It’s my next big project and takes me back into the Urban Fantasy world. 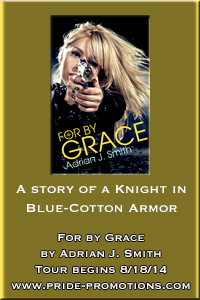 Adrian J. Smith, or "AJ" as she is often called, is a part time writer with an epic imagination, sharp wit, and kind heart that gets her into a bit of trouble when it comes to taking in all the neighborhood stray cats. Being obsessed with science fiction, Smith often goes off on tangents about the space-time continuum. She is also a part time lunatic with a secretive past. It's been rumored that she was once a spy for the government, but anyone who has gotten close enough to know the truth has never lived to tell the tale. When traveling around the world on various classified tasks, Smith requires the following be provided: buffalo jerky, mimosas, and eighty six pennies. This is all we know about the reclusive woman. Hitting the gas, Grace got as close to the truck as possible. They weaved in and out of traffic, cars pulling over to the side and hitting their brakes as the driver either caught sight of the truck or heard her sirens. He blasted through a red light, horns beeping continuously at him as she drove to catch up. Grace slammed on her brakes. She let out a quick breath as a black mustang came to a forceful stop, letting her drive past them. She picked up her speed, scanning the roadway ahead to try and see where the Ford had gone. Biting her lip, Grace cocked her head to the side, skimming the intersections to make sure everyone had stopped or was coming to a stop before she went through them. One car was too close of a call for her.